Each year I like to try something different in the garden. This year I tried growing dry beans as in soup beans. My family substitutes beans instead of meat for many meals so my choice for my trial fit in very well. Once I decided to grow dry beans, the first choice I had to make was which type to try. As I started my research, I realized there were a lot of choices out there. I decided to choose two different types. I knew I liked navy beans for bean soup and similar dishes so the first choice was easy. However, my second choice was a bit trickier. I am a big fan of traditional concepts so I decided to narrow down my choices by selecting a bean that was around during colonial times. After doing some research on-line, I found a bean that many claimed had been around for a really long time. The bean was called Jacob's cattle. It was also rumored on-line that native Americans in Maine gave the Jacobs cattle bean to some early settlers to America. My decision was made. I ordered my beans from an online store and awaited spring. Once spring came and the threat of frost went away it was time to plant. My garden at my place was pretty full so I asked my dad to plant some at his place. This was a good crop to grow away from my place because once you plant it you do not harvest until the bean pods die down. Once the beans were planted in the spring fast forward until the early fall. 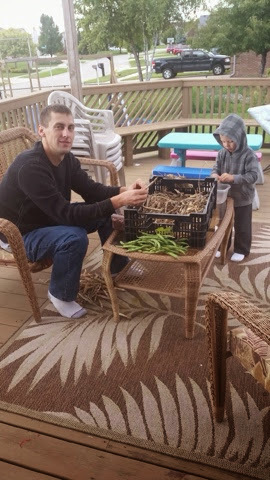 I took a trip up to my dad's place to harvest the beans along with a few other projects. 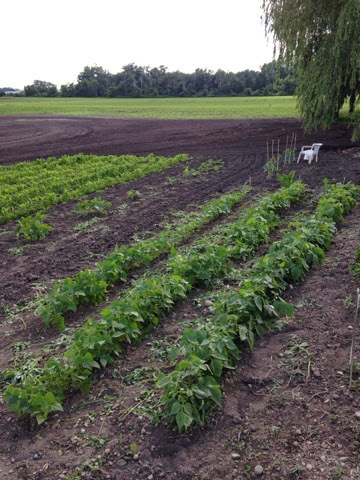 Once I arrived at the garden, I was very happy to see how well the beans turned out. The majority of the beans were dry in the pods so we decided to harvest them. 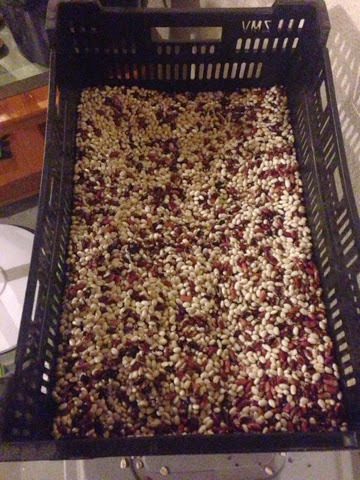 Once the pods were picked, I placed them in a plastic grate to allow the bean pods to dry down further than they already were. After a week or two, I decided to crack open the pods. The majority of the beans were very dry so my son and I started cracking away. After an hour or two, we ended up with quite a few beans. 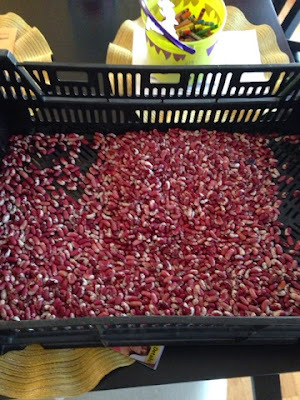 Those beans went back in to the produce bin to dry down further but not before being sampled. When we ate the beans, we found out they were very tasty. These beans are being stored in my basement currently. Once I am confident the beans are dried down to my liking I will transfer them to a container for winter storage. The beans in the beginning. The dry beans ready to be processed by hand. Great Northern and Jacob's cattle. I am very happy how my beans turned out. I will be able to make quite a few dirt cheap meals over the winter. Using dry beans to cook with is always cost effective but even more so when you grow them. My beans taste so much better than the ones I can get in the store. 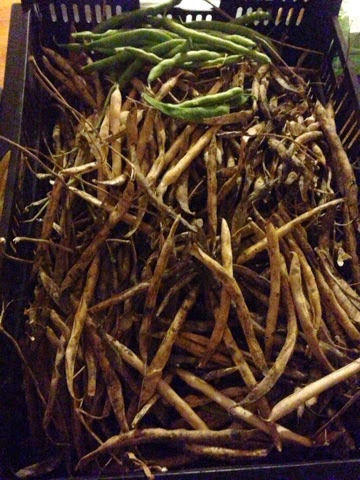 Next year I will replant 50 or so beans of each variety I grew this year along with one or two more selections for next year. I know I definitely want to grow the Cherokee trail of tears bean which was a bean carried by the Cherokee Indians back in the day when they were kicked off of their land. I haven't decided what the second bean is going to be but I look forward to doing the research.